I finally took down the pancetta I had hanging in my basement. I thought the recipe said to cure for three weeks, but when I checked last night it turns out I was only supposed to hang it for two. Oops! I think it is still safe to eat - it passed the sniff test, and it looked fine. Plus, pancetta isn't served raw, so cooking should kill anything that might be left. I noticed one tiny spot of what could have been a white fuzzy mold on the meaty part, but didn't smell anything. 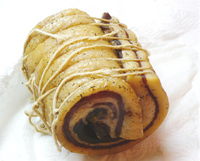 I scraped that bit off, and actually unrolled the pancetta to make sure there wasn't anything nasty hiding inside. Since I only had a 2.5 lb slab of pork belly, it didn't roll up as tightly as I would have liked, so although there was some sticking, it unrolled completely. I suppose it shouldn't do that - next time I'll use a larger piece of belly so I can roll it up tighter. Pancetta freezes well so a larger piece won't go to waste. 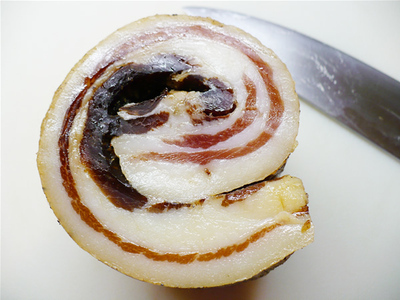 Pancetta is cured but not smoked, so it is a perfect recipe for a beginner like me. You rub the cure over a flat piece of pork belly and refrigerate, flipping the belly over every day to evenly distribute the cure. Once the meat has firmed up, which takes about a week, you roll it, tie it, and hang it for two weeks in a cool place with decent humidity. Our basement was nearly ideal, if a tad on the dry side. The relative humidity stayed at about 50%, although I think 55 to 60% is ideal. The temperature, though, was spot on at a pretty constant 60 degrees. The only tricky part was finding a place to hang the meat where none of my six cats could reach it. I ended up hanging it in the middle of what will be the family room, if we ever get around to finishing it. The first day or so the cats camped out underneath it, looking up longingly at the pork belly. After a few fruitless days they gave up and ignored it. The upside to having six cats is that they kill any insects that may find their way into the house, so I didn't have to worry about flies and other bugs landing on the meat and leaving, um, deposits. The first use for the pancetta was carbonara - one of my favorite weeknight meals because it is easy yet delicious. I diced 8 ounces of the pancetta and fried it in extra-virgin olive oil. When the pancetta was crispy, I poured in half a cup of vermouth and let it cook down until syrupy. I beat 3 eggs, diced garlic, salt and about 3 ounces of grated Parmesan Reggiano in a small bowl. Once the pound of spaghetti had cooked, I drained it (reserving some of the cooking water), and added the eggs and cheese. I added a bit of the pasta cooking water to keep it moist, then added the pancetta mixture. Finally, I ground black pepper over the mixture. It was delightful - and we are still here two days later, so the pancetta must be safe to eat. That does look nice, I have to roll mine tonight.